One of many pitches to "shop small" outside a store for Small Business Saturday's local shopping day along the Post Road, Saturday, Nov. 25, 2017, in Darien, Conn.
DARIEN — The well-marketed fanfare of Black Friday’s big shopping experience looked like it took some of the vitality out of Small Business Saturday, at least where local shopping was concerned. 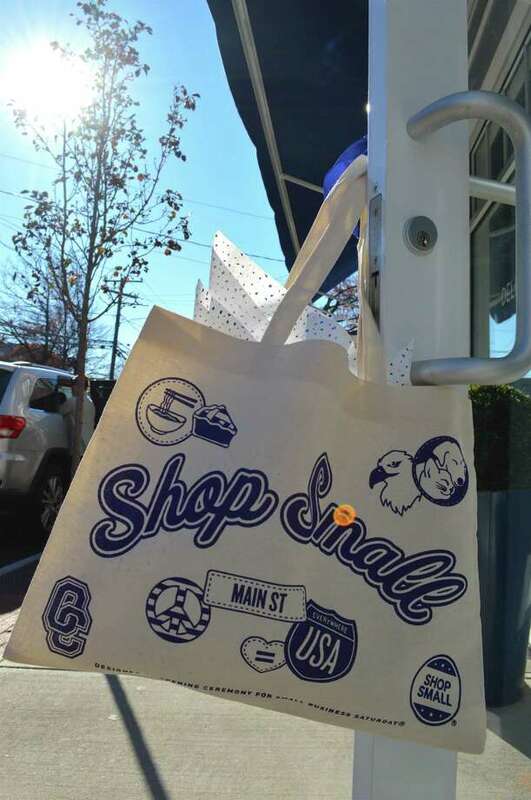 Despite some support from Darien’s Chamber of Commerce, which provided balloons, signs, and even some small Christmas trees to member stores, customer turnout out was minimal on a day when it appeared many locals were out of town. Still, several stores welcomed visiting customers in the spirit of supporting local shopkeepers this holiday season.